Increases Total Alkalinity and pH in spa and hot tub water. The lack of buffering that occurs if the Total Alkalinity is to low will cause the pH to fluctuate significantly. Water low in Total Alkalinity can also corrode equipment, etch some spa surfaces, cause skin and eye irritation in bathers and excessive chlorine usage. Increases levles of Alkalinty to ensure perfect water balance and crystal clear water. Quality food grade material so it won't cloud water. 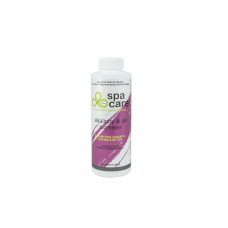 Spa Care™ Alkalinity & pH Increaser should be added in accordance with the directions given. Do NOT overdose and ensure you get your water regularly checked by your local Lo-Chlor Dealer.